Beeva D.A., Berbekova I. , Beev A. A., Kvashnin V.A. , where R is the remainder of diphenol. Polyhydroxyether is a thermoplastic polymer, which is obtained by the interaction of dihydric phenols with epichlorhydrin or n ─ diglycidic ethers diphenols with diphenols. Unlike epoxy resins, derived from the same starting compounds, polyhydroxyether have a large molecular weight and contain virtually no epoxide groups [1,2,3], so the polymer is thermally stable and can be processed by methods used for thermoplastics . On the basis of polyoxyethyl get thermoplastic coatings and adhesives with good properties. The first polyhydroxyether as epoxy resin, were synthesized in the early 30-ies, but until the end of the second world war, they have not found practical application. In 1949 there were reports about the production of polyhydroxyethyl for the manufacture of films and fibers in Western countries. These polymers received one — stage or two-stage method in industrial scale. The coatings based on polyhydroxyether has been applied in the USA in 1961. Utracki L. A., considering the history of commercialization of polymeric materials, according to [5, 6] that the first industrial polyhydroxyether of bisphenol A released in 1962 by the firm Union Carbide under the trade name «Phenoxy». Then began the development of these polymers for the production of plastics, films, adhesives, etc. By 1965, polyhydroxyether of different molecular weight have become widely available . In the world polyhydroxyether based on diphenylolpropane and epichlorohydrin, are known under the trade name «Phenoxy» (USA) and «Epiterm» (Poland), produced and used widely in industrial scale. Russia has not developed the technological scheme of the synthesis of polyhydroxyether in large volumes. There is a pilot plant which allow to obtain polymers with a molecular weight of 20 -100 thousand. The leading position among all manufacturers of phenoxy resin is firm InChem Phenoxy Resin, located in the state of South Carolina, USA. The company was founded in 1992 and manufactures a wide range of chemical products, phenoxy resin in granules, powders, solutions and aqueous emulsions. The main monomers for the synthesis of phenoxy –resins are epichlorohydrin and bisphenol A.
Bisphenol A (4,4/— dioxidiphenylpropane, Dian). Diphenylolpropane was first synthesized in 1891 by the Russian scientist A. P. Dianin by condensation of phenol and acetone (hence the letter «A» in the trivial name bisphenol). In honor of the famous chemist received a substance in many countries called Dian. In industry diphenylolpropane for the first time in 1923 started to produce the German firm «KurtAlbert» for the production of synthetic resins. However, the wide spread and significant growth in the production of this diphenol occurred in the 50-ies of the last century. Since then, diphenylolpropane is increasingly used in the chemical industry to produce valuable chemical products epoxy resins, polycarbonates, etc . In the world today it produces about 2.8 to 3.0 million tons of diphenylolpropane in the year. So runs the «direct» one-step process of obtaining polyhydroxyether. There is also an «indirect» two-step method, the first stage of which receive p-diglicidilether (for example, diphenylolpropane) and in the second stage, carry out its interaction with bisphenolate. Depending on the method and conditions of synthesis get polyhydroxyether with a molecular weight of from 20000 to 100000, which are used for obtaining of plastics, adhesives, coatings, and adhesives. heterophase synthesis of diphenol with epichlorhydrin with appropriate selection of solvent, catalyst, emulsifier, mixing mode. These methods have certain advantages and disadvantages. However, they vary based on the conditions of synthesis and the source substance, the catalyst, which allows, depending on the applications of polymers to choose one or the other method. The authors suggest a method for the synthesis of polyhydroxyether with a molecular weight above 30,000 by processing diphenol (for example, 2,2 bis-(4,4′-oxyphenyl)propane) equimolecular number of epichlorhydrin (e.g., epichlorohydrin) and excess alkali NaOH in aqueous medium at a temperature of 150-200°C. A method in its seeming simplicity is complicated by a relatively high reaction temperature, which is above the boiling point of the used liquid components of the solvent — water and epichlorhydrin, which may lead to violation of equipollence reagents in the reaction mixture. In addition, the water and epichlorhydrin are mixed only partially, so interfacial phenomena will hinder the flow of the main reaction. The result is a six-hour boiling of a mixture of epichlorhydrin (0.1 mol), 2,2-bis(4-oxyphenyl)-propane (0.1 mol) and 0.11 mole of sodium hydroxide in 65 g of 36.9% strength ethanol was obtained white powder which melted at 160-165 °C and has an intrinsic viscosity of 0.43 DL/g (1 % solution in m-cresol, 25 °C). In the study of the regularities of synthesis of polyhydroxyether from epichlorhydrin has been shown  that the amount of alkali is decide-conductive factor determining the intrinsic viscosity of the resulting polymer. The greater the amount of sodium hydroxide, the viscosity is higher (table 2). Interaction equimolecular quantities of multi-core two-atomic phenol and epichlorhydrin carried out in the presence of the same amount or excess alkali. Stepwise introduction of alkali, and a stepped heating contribute to the occurrence of exothermic process of joining the molecules of epichlorhydrin to bisphenol molecule and increase the speed of endothermic processes — dehydrochlorination and addition polymerization. However, the reaction is carried out in solution slows it down, does not allow to achieve high molecular weight, as in the presence of bases, in solutions of epoxy oligomers is enhanced by an open circuit. Therefore, the methods discussed above do not allow to obtain high molecular weight reaction products. Polyhydroxyether suitable for the production of films and press articles having high mechanical and thermomechanical properties are obtained by reaction equimolecular quantities of epichlorhydrin and diphenol in an aqueous-organic medium under the action of alkali metal hydroxides. The method is also used by step-heating and step-wise introduction of alkali. A method of obtaining a thermoplastic polyhydroxyether, suitable for the manufacture of packaging films, characterized by improved physico-mechanical properties and low content of substances extracted in contact with food. Japanese researchers  to obtain polyhydroxyether on the basis of epichlorhydrine and diphenol in the solvent used hexamethylphosphorotriamide. For the synthesis use different divinelys. The use of the amide solvent, which can play the role of a catalyst affects the reaction rate. the reaction mixture stepwise and the introduction of catalyst allows you to adjust sequentially occurring exothermic and endothermic reactions, which is very important in the development of the process technology on a larger scale. The disadvantages of most methods is the contamination of the product with salts, catalysts, which degrades the dielectric properties of the product. Drawback — the duration of the process (8-24 hours), reducing its effectiveness in an industrial environment. where R is a phenyl radical. R — is a substituted or unsubstituted divalent aliphatic radical containing more than two carbon atoms. The polymer chain growth occurs by the interaction glycidil-ether group of one molecule with oxyaliphatic group of another molecule. Homopolymerization the compounds synthesized high-molecular polyhydroxyether for protective coatings. As catalysts use of Lewis acids. Used for the synthesis of esters containing aromatic residues of different structure that allows you to adjust the properties of the polymers. 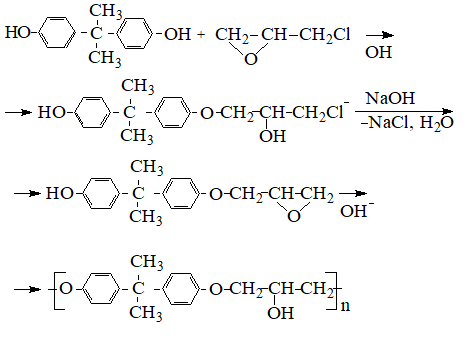 Patented the method of preparation of high-molecular polyhydroxyether with a molecular weight of 50-500 thousand by catalytic addition polymerization of (4-epoxypropoxyphenyl-4-hydroxyphenyl)dimethylmethane. Polyhydroxyether for the preparation of compositions and methods for their preparation provides Darrell with employees. The reaction is carried out block polymerization or interaction monoglycidyl esters in solution at a temperature of 20-200 °C depending on the solvent. The process is carried out in methyl isobutyl ketone, cellosolve, methyl ethyl ketone in the presence of salts. In the processing of crosslinking agents, for example, amines, fatty acids, polyisocyanate get net polymers. The synthesis of polyhydroxyether homopolymerization has some advantages. Monoglycidyl esters contain in their molecule one phenolic hydroxyl and one group that gives the opportunity to avoid the application of the two-component system and virtually eliminate all the error in the ratio of functional groups. Propose to carry out the reaction in the block or the solvent in the presence of catalysts of Friedel-Сrafts. But the Chrome studies are not allowed to polyhydroxyether with a molecular weight above 12-15 thousand by this method. Depending on the starting substances can be identified and the third group methods are «indirect» method of obtaining polyhydroxyether through interaction diglycidyl esters diphenols (or diepoxides) diphenolate. Based on the analysis of experimental data was reported that attempts to obtain high molecular weight products by direct polyaddition of a diisocyanate diepoxide compounds and bisphenols were unsuccessful. Greatest molecular weight of polyhydroxyether reached 8000. However, in the patent literature, there is a lot of information about how to obtain polymers of high molecular weight reaction diepoxides and diphenols. As diepoxide compounds have been used aliphatic, aromatic glycidyl ethers, epoxide coat dienes, diglycidyl ethers of dicarboxylic acids, mixtures of these diepoxides. Catalysts of polyaddition served tertiary amines of diverse structures. To obtain linear high-molecular polyhydroxyether  the interaction of diepoxides with bisphenolate was carried out at a molar ratio of 0,5:1 to 0,9999:1 at a temperature below the softening temperature of the mixture in the presence of catalytic quantities of a tertiary amine. Polyhydroxyether to obtain film materials with good adhesion to glass offer to synthesize the interaction of block and diepoxides diphenols. As catalysts use tertiary amines, derivatives of quaternary ammonium bases, N-alkylamide, N, N-dialkylamide acids, dialkyl- or tetraalkylammonium urea or thiourea, dimethylacetamide, dimethylformamide. Before the end of the synthesis the product can enter the filler. The process of addition polymerization is carried out at temperatures of 110-140 ° C for 20-22 hours . I propose to obtain high molecular weight products of low molecular weight epoxy resins and bisphenols in the presence of catalysts of lithium hydroxide  or tertiary amines. The synthesis of polyhydroxyether with a molecular weight of about 84200 carried out in the presence of catalysts — salts phosphonium, hydroxides alkaline or alkaline-earth metals. As starting compounds are diglycidyl ether of 4,4/-dihydroxydiphenylpropane and bisphenols. Methods of blockpolymerization diglycidyl esters and bisphenol, as shown by literature data, allow to avoid a large amount of contaminated wastewater. However, these methods require the use of high temperatures, lengthy processes used catalysts contaminate the final product, degrading the dielectric properties. There are several reports about getting polyhydroxyether on the basis of diepoxides and bisphenol in solvents. Thermoplastic polymer for the manufacture of sockets for radio, electronic devices, abrasive-, and chemical-resistant coatings get [7,15] in the methyl ethyl ketone from the starting materials 100% purity in the presence of Quaternary ammonium bases. Synthesis continues 75-80 hours at a temperature of about 80 °C. Branched polyhydroxyether to cover film, protect them from gas bubbles, water  the environment ethylcellsolve, methanol in the presence of tertiary ammonium salts. The process finished after 20 hours of synthesis at a temperature of 90 °C. The improved synthesis of the epoxy resin and polyhydroxyether low in aliphatic halogen interaction is carried out at 80-120 °C diglycidylether ether diphenol with diphenols in the environment of aromatic hydrocarbon or ketones in the presence of 0.2-1 % aliphatic compounds containing at least one hydroxyl group, for example, polyethylene glycol, and from 1 to 3 moles of alkali metal hydroxide. Polyhydroxyethers with improved processability, mechanical strength and gas-protective properties, receive in a two-phase system water─ organic solvent with the aid of catalysts of the basic nature or catalysts of interphase transfer. Synthesized polyhydroxyethers used for forming packages for oil, beer, wine, seasoning, cosmetics. The disadvantages of methods for the synthesis of polyhydroxyethers in solutions on the basis of diepoxides and diphenols are the duration of the process, large amounts of toxic waste water, a high proportion of reactions of chain breakage. The USSR had developed technology for producing polyheterophase condensation of diphenol with epichlorhydrin with appropriate selection of solvent, catalyst, emulsifier, mixing mode. The process is carried out in the presence of sodium carboxymethyl cellulose as an emulsifier and a solvent of the organic phase of isopropyl alcohol at a temperature of 80 °C for 3-6 hours with continuous stirring . However, the widespread introduction and dissemination of the method has not received due to the large contamination of the final product salts, catalyst, emulsifier and impair properties of the polymer, low manufacturability of the process due to the partial crosslinking of the resulting polymer. 2. Phenoxy - a new thermoplastic // Modern plastics. - 1962. - № 11. - Р. 169-172. 4. Reinking N.H., Barnabeo A.E., Hale W.F. Polyhydroxyethers. I Effect of structure on properties of high molecular weight polymers from polihydric phenols and epichlorohydrin // Journal of appl. polymer . Sci. - 1963 - V.7. - Р. 2135-2144. 5. Ютраки Л.А. Промышленные полимерные соединения.- Монреаль, Канада, 1996. – Р. 45-48. 6. Bugel T.E., Norwalk S., Snedeker R.H. Phenoxy resin – a new thermoplastic adhesive. // ASTM Standards and engineering digital library.- 1964. - Р. 9. 8. Верховская З.Н. Дифенилолпропан.- М.: Химия.- 1971. - 196 с. 9. Пат. 3277051 США, кл.260-47. Preparation of polyhydroxyethers. 10. Пат. 28792 Япония, 26с 11. Получение полигидроксиэфирных смол. 11. Пат. 3298981 США, 260-18 Polyhydroxyethers of 1,4-cyclohexanedimethanol. 12. Пат. 1122687 ЧССР, 39с30 Способ получения высокомолекулярных полиоксиполиэфиров. 13. Пат. 3336257 США, 260-47 High molecular weight thermoplastic resin from the polymerization of diphenols and diepoxides. 14. Пат. 131054 ЧССР, 39с30. 15. Пат. 4684701 США, 525/505, C08 G59/14. Method for preparing advanced epoxy or phenoxy resins with low aliphatic halide contents. 16. Пат. 2124630 Англия, МКИ3С08 G65/28. Branched phenoxy resins. 17. Благонравова А.А., Непомнящий А.И. Лаковые эпоксидные смолы. -М., 1970. - 248 с.